Hey guys! I know it's been forever since I've done a post, but just wanted to let you know I've developed a new blog - Feeding Andy! It's still pretty simple in format (when I have time, I'll spruce it up), but I hope you join me there from now on! Well hello there! It's been about a month since my last post! Trust me, April was a whirl wind of a month. First and foremost - I GOT MARRIED! We went to Vegas for our honeymoon and had a blast! And this past weekend was Derby weekend (which is basically the Black Friday for restaurants around here - it's been CRAZY busy and I'm utterly exhausted!). Anyway, I'll definitely post pictures as soon as I can. But the reason we're here right now is to talk about a club. The Secret Recipe Club. One of my favorite blogging groups. 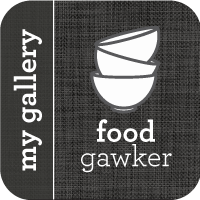 It's like a secret Santa for food bloggers. You end up with an awesome blog to pick a recipe and blog about, and in return, someone ends up with your blog, as well! Exciting, huh? Well this month I got the pleasure of getting Connor's Cooking. Raina has a plethora of great recipes to choose from. Everything from Shrimp Tortellini Pasta Toss to Guacamole. It was a hard decision, but I settled on Raina's Barbecue Chili w/ Corn. It was a quick and easy meal, that made enough to feed us for a few days! The only changes I made were to use black beans instead of barbecue baked beans and chipotle chili powder instead of regular, but only because I had those on hand already. The recipe was quite tasty and I'll definitely be making it again and again! In a large pot under medium high heat, add ground beef and onions and cook until beef is no longer pink. Drain. Stir in black beans, tomatoes, tomato sauce, corn, chili powder, and cumin. Bring to a boil and then reduce to a simmer. Simmer for about 10-15 minutes, stirring occasionally, until corn is tender. Season with salt and pepper, to taste. 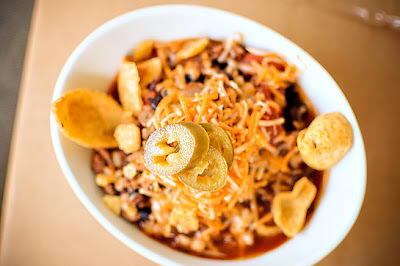 Ladle chili into bowls and top with your favorite chili toppings. Enjoy! Hope you guys check out Connor's Cooking and if you're interested in joining the Secret Recipe Club, click here to find out more! Wanna Help Us With Our Wedding Planning? Donate to our Paypal account today! My Fiance Likes It So It Must Be Good. 2011. Simple theme. Powered by Blogger.